Many of you have just recently finished two weeks of extreme stress. Why? 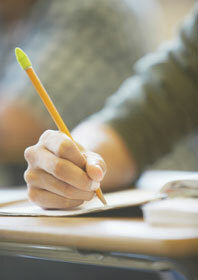 The first two weeks of May are when AP (Advanced Placement) exams are administered across the country. Although these exams cause tremendous angst among high school teenagers, much of that fear is unfounded. AP exams are much less important to the college admissions process than most high school students, counselors, and parents think. Most college applications do not require or request AP exam scores. You can apply to many elite universities and never reveal your AP exam scores. Unlike the SAT, there is no official AP score report that gets sent directly from the College Board to the universities you apply to. This is good news for many high school students who have gotten 1's or 2's on past AP examinations, or who believe they didn’t do so hot on a recent examination this year. However, some colleges do request students to self-report AP exam scores, so it's always a good idea to double-check with the institutions you are applying to. In addition, some high schools report students' AP exam scores directly on their school transcripts. If this is the case for your high school, it is imperative that you score well on AP exams. If a college admission officer sees that you got an A in an AP course—but scored a 1 or 2 on the associated AP exam—that raises a red flag. Either the high school exhibits grade inflation or you did not care to take the exam seriously. That being said, simply taking AP courses, more so than the exams, can be very valuable. A well-taught AP class can prepare students for college-level courses, and many AP courses contain challenging subject matter similar to what students would encounter in a college class. Colleges see the value in AP courses and view applicants who have taken multiple AP courses favorably. Such a course load shows that a student is challenging him/herself intellectually. And many colleges will let students place out of basic courses or grant elective course credit based on AP exam scores. Most credit is granted as long as a student passed the AP test (achieving a 3 or higher). So, again, there is no reason to fret about not achieving an AP score of 5 on every exam. But if AP test scores don't carry much weight in the college admission process, what does? Well, your GPA and standardized exam scores (i.e., SAT, ACT) matter the most. And while most colleges do not require AP exam scores, many competitive universities do require students to take SAT Subject Tests. SAT Subject Tests are one-hour exams that cover topics such as mathematics, chemistry, biology, U.S. history, literature, Spanish, etc. While you don't need to take all of them, competitive colleges often require applicants to take at least two. And unlike AP exam scores, SAT Subject Test scores are reported directly from College Board to the colleges you apply to (on the same score report as the one sent for the SAT). So it is important that you take these tests seriously because colleges will see your results. But notice how many SAT Subject Tests have a corresponding AP course—it’s in your best interest to take the SAT Subject Test that corresponds with the AP exams you have already studied for. Essentially you will be killing two birds with one stone.